When the wind blows leaves turn upside down and show their lighter sides. I'm choosing a tree to follow. what plants grow round it and what they do. And I invite others to join me - to choose a tree and to 'follow' it too. Then I forget who's following what tree and lose the list and get it all wrong and muddle it up . . . but the trees (fortunately!) grow on - well, mostly they do. Sometimes bits drop off. Sometimes whole trees fall over or die. So . . . I have two tasks. The first is to choose a tree. The second is not to lose the list. For the first . . . over the next few posts I'll be looking at several trees, wondering which will be 'THE' tree for me this year. Then, having viewed the talent (as it were!) I'll say which one I'll specially follow. 2. At the end of every Loose and Leafy Tree post so you can link to your own posts about particular trees. I'm just about to do a spate of tree posts so there will be lots of opportunities for you to give links to tree posts on your blogs while I get used to the system! Then, when I've got the hang of that, I'll whittle it down to a Linky a month. This, for me, will be a challenge. People generally like things to happen on particular days . . . I find particular days a bit of a challenge . . . but . . . we'll see! So . . . for my first 'Will I follow it?' 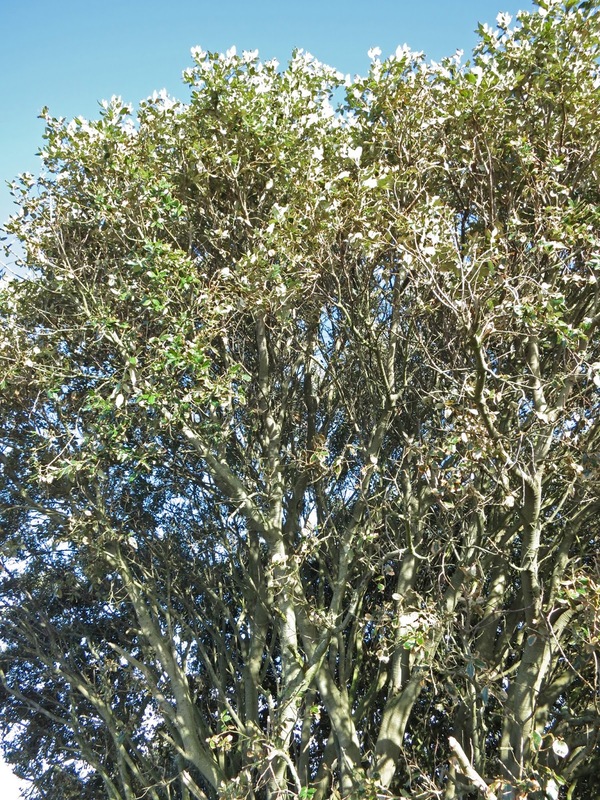 tree, I've been looking at what I think is a Holm Oak - Quercus Ilex. Or, rather, to deviate from the point right from the start - a little grove of Holm Oaks instead of one particular tree. They have tough, ever-green leaves, long acorns (when they have any at all - which isn't often) and pale trunks. This tree is on a steep slope above the sea. The ground is always dry. It makes a good place for children to play. There's a part two with more about this tree HERE. It's good to see that you're doing this. I'll probably chose the willow that is just by the gates to the allotment, and which I usually photograph a few times a year. Brachylaena discolor is my tree for flashing silver undersides in a breeze. 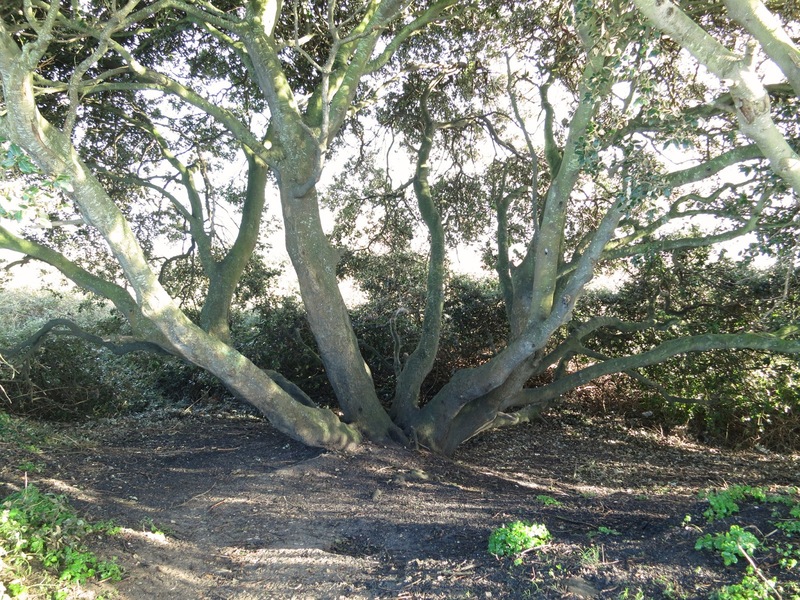 Common name is coastal oak, altho it isn't any sort of oak tree! All is time I've thought it was a HOME oak, I suppose because I've mainly heard the name spoken on GQT! 'How cosy,' I've always thought. It's so native to the UK it's called the Home Oak, even more familiar than just being the national or official tree, it's the Home Oak! See it, and you're home! Home sweet Home Oak! Maybe the Home Office moniker helped with this misconception? Anyway, it is lovely, Home or Holm! I'll give it a go this year Lucy - not sure which tree yet - but I think it's a great idea to give trees a closer inspection throughout the year. OK, I'm in, and will sign up on Mister Linky so that shame will make me keep up! I don't do well with regular days either, so I am rather relieved that you won't be particularly rigid. I love the idea of you roaming the neighbourhood "interviewing" trees for this year's posts! I really like this week's candidate just because I always love trees with interesting trunks that just invite you to scramble and climb all over them. Thanks, Lucy, for contacting me about following a tree this year. This morning I was wondering if I should do something, then I saw your comment at Plants & Rocks ... I'm on board! Just got back from a visit to my latest tree friend(s), and hope to post something this weekend. Similar situation here in Wyoming -- windy, cold, snow, not photo-friendly. But then these trees don't have leaves yet, so it's not quite so bad. What a lovely blog. Thanks for posting on mine. Usually I do not make a space there for trees although they are all around our property. Will give this some consideration. Sounds like a lot of fun!! I don't think I have the correct level of "attention span" to a be a good tree-follower! Nevertheless I shall try to write about trees more often, and I shall enjoy reading about yours. Hello Flightplot. I'll put you down for 'Willow' then on the tree following page http://tinyurl.com/bv6pzt5. If you decide on a different tree after all, that's easily changed. Hi Diana. I'm not completely and utterly sure this is a Holm Oak - though I hope I'm right or I'll feel a bit silly. I'll be doing another post on the same tree to show it in more detail - bark etc. Maybe someone will be able to confirm (or change) its ID. Hi Rosa. It's great to hear from you. 'Home' oak would be a great name, wouldn't it? But it gets more complicated. There are several kinds of oak in England and the Holm Oak isn't the 'national' one with the familiar, wibbly sided leaves. 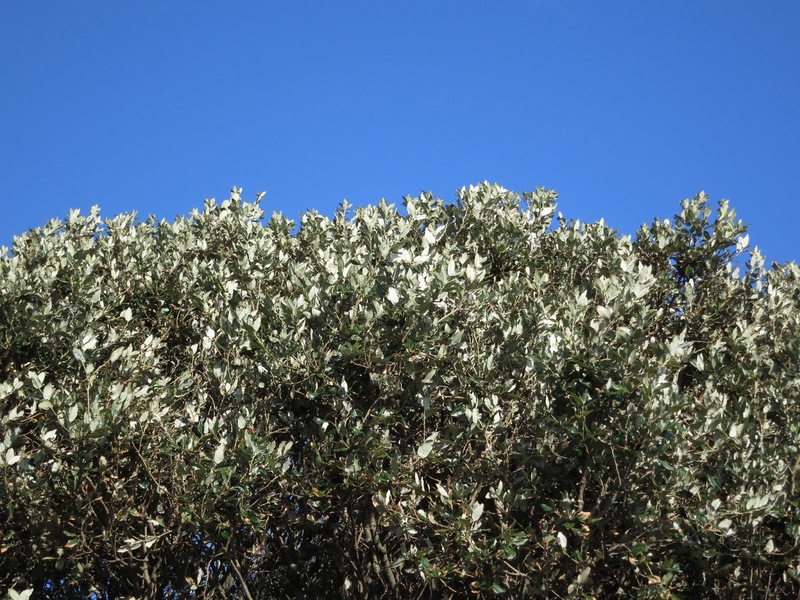 Further - I don't think the Holm Oak is a native tree - though the definition of 'native' is a little obscure given that masses and masses of our familiar plants and, dare I say it? weeds, have been imported or have floated in from somewhere at some time. How about following a tree with us? It would be interesting to have something which grows in your (very different from Dorset!) climate! I know you don't blog as much as you used to but I'm planning to make space available on Loose and Leafy to people without blogs - so you could do it that way - email a photo and a paragraph from time to time and I'll put it in a post here. Hi, Elaine. Glad you're joining in. I've put you on the list on the tree-following page and have said your choice of tree is 'to be announced'! Hello Janet. One of the good things about this tree is that it has a good space of worn earth around it so the lovely trunks are on view. (For all that it's in a hollow!). Tall plants grow up around many of the other trees round here. Either that or the trees themselves are up on banks. Both of which make photographing them difficult. Hi, Hollis. I'm glad you are joining in again. The terrain you blog from is specially interesting to me because I've never been anywhere remotely like it! Let me know what tree you've chosen. I've put only the first of the series but people can read on if they wish by following your own links. Hello Gardenbren. There's so much to blog about! But, yes, do think about following a tree. It would be good to have you join in. And there are no 'rules' about how often you post about 'your' tree or in how much detail - as long as you give an idea of how it changes through the seasons. I find it really gripping to do this and gain a different kind of affection for whichever individual tree I'm paying special attention to. Indeed, once started, I find it hard to stop so my own list of 'followed' trees is growing from year to year. Hello Mark. Yours isn't exactly a tree-following kind of blog - if only peppers grew on trees! Or carrots! That would be fun. But it will be good to have you reading along with us. Nice and 'LOOSE AND LEAFY' to all your pictures. Great. Hello! This is totally brilliant idea! I'd love to join in, and will be following Common Alder, Alnus Glutinosa. We've planted a few of these on our windy, exposed and occasionally soggy plot as they are tough and don't mind getting their feet wet, apparently. You can also coppice them for fuel, which we plan to do in 15 years or so - hopefully! Hope it's OK to follow a tree I planted, not one 'in the wild' as it were. I like the tree you chose. I will have to decide which trees to follow. I have several small new ones and then there are the ash trees we are hoping won't get infested. With spring coming, I will choose and get back to you. Thank you, Lucy, for adding me in. I may have mentioned that I have never 'done' Mr Linky before, and would be very grateful if you might post a few simple steps of exactly how this should work. I'm excited by the project but a bit bewildered how to start, in terms of the techie bits! I have told my art group about your great idea and am going to mention it on the blog tomorrow. I am pretty sure one of my friends will join in. Collecting Horse Chestnut stuff now ready for an end Feb/early March post.